I recently read Little Soldiers by Lenora Chu. It is part personal anecdote, supplemented by research, and tells of an American couple (one half of whom is Chinese-American) who moved to Shanghai for work and made the decision to enter their son in the Chinese school system. Chu’s insights on the system, particularly those from her personal perspective, are fascinating. The book opens with note on Shanghai and its status as dominating the world’s academic league tables. Chu at no point questions the strength of Shanghai’s academics, but she does debate the values of the system. Throughout the book we continually see Chu finding herself at odds with the top-performing Shanghai school, and in parts of the book I couldn’t work out whether I sympathized less with Chu or the school. Chu cites ‘troubling signs’ in her four-year-old son, including a ‘habit of obeisance,’ giving the example of her son, Rainey, saying ‘I don’t like singing, but if you want me to do it, I’ll do it.’ More troubling to Chu is that Rainey doesn’t like eggs, and she discovers that the teacher has put egg in his mouth, which leaves her feeling affronted at this invasion of her son’s choices. Although the episode did make me feel very uncomfortable, the mother’s interactions with the school also contains an uneasy kernel of truth that the Western way is far from perfect: “‘We motivate them to choose to eat eggs,’” she tells the school. “‘Does it work?’ ‘Well… not always,’ I admitted.” What is clear in this, and all episodes, is the Chinese clarity on values, with a black/white sense of right and wrong. The teacher follows up this conversation saying: ‘Rainey needs to eat eggs. We think eggs are good nutrition, and all young children must eat them.’ Conversation over. At a number of points, the Chinese teacher advises that narrator ‘refrain from questioning my methods in front of Rainey… it is better that the children think we are in agreement about everything.’ I could not agree more. Although parents questioning a school’s practices can provide vital feedback to school leaders, if this is done in front of the children it can be undermining and give children an ‘out.’ I’m always grateful when parents ask to speak with me one to one after their child has left a parent meeting to share their concerns about how an issue is being dealt with. Indeed, at times I did feel the narrator came across as slightly disrespectful to the teachers – not only in questioning their choices in front of her son, but also when she narrates her husband complaining as they tear and staple their son’s many worksheets of an evening: ‘Shouldn’t this be the school’s responsibility? Or a teacher’s aide?’ I am grateful that the narrator has been so honest, but I found this a shocking insight that parents would be so unwilling to do this kind of admin for their child, especially so given the massive class sizes in China. This factor would mean this kind of task, if done by a teacher, would take vital hours they could be spending more productively, in terms of planning the children’s learning. At another point in the book, Chu is concerned that Rainey doesn’t want to stand out, for example on the school’s ‘grandparents day’ when he does not have a grandparent available to fly across the ocean and is advised to stay at home for the day (which does, I think, seem a little insensitive). Chu comes in and stands in the place of the grandparent. Chu’s worries this is due to ‘the Chinese cultural focus on the collective rather than the individual,’ but I think this issue transcends culture: in my experience, all children are sensitive to difference, and those who do not conform are often picked on, in nursery and primary schools often cruelly so. Again, though, it is shocking from both sides. When Chu and her husband visit the school to air their concerns about their methods, they are told during the meeting that their child is mounting other children like they are a donkey and hitting them. If I’m honest, their response is nowhere near as shocked on hearing this as I expected – surely this is a cause of huge embarrassment to them? (“‘Oh,’ I responded, as flatly as I could. [The teacher] looked at me with surprise, as if she’d expected me to recoil with horror. I was concerned, but frankly, I also wanted to laugh.’) Though I admit my experience of teaching reception children is precisely zero, so perhaps this is normal. The book is underscored with the parents’ Western prioritisation of individualism and exceptions – yet their child actually adjusts quickly. As Chu says: ‘unlike me, I could see that Rainey had adjusted. He was finding his own way to get things done. He wanted more water, and he’d discovered that faking a cough was the most effective way to accomplish his goal without triggering the teachers’ ire.’ She finds that when they return to the USA for a vacation, everyone who meets them is amazed at how well behaved their son is and how advanced he is. The son’s pride in these interactions gleams off the page. As with so many of these cross-cultural studies, it all ultimately comes down to what you value in education. The author cites country after country rejecting their low PISA results claiming that the ‘results don’t measure what we value.’ Chu cites the evidence that American children score far lower in Maths than their Shanghai peers, but follows up with the evidence that the American children who do score highly love it. This raises an important question: what is better, doing well, or loving the subject? And aren’t both outcomes possible? It is also unequivocally disturbing for this Western reader to hear children being called by numbers and not names. Indeed, it is clear that the Chinese system is far from perfect, most notably in the chasm of educational achievement between rural and urban areas. There are deep inequalities, with frightening numbers of children falling out of the system altogether. At the same time, there is lots to learn. Chu quotes the values of Chinese educator Xiaodong Lin: ‘Americans emphasise achievement without hard work. They believe in the concept of genius. This is a problem. The Chinese – they know hard work.’ This includes training children to endure discomfort and persevere anyway: Chinese schools usually lack even the basics like heating, where, in contrast, an American educator is quoted saying his class can’t even sit still for an hour. 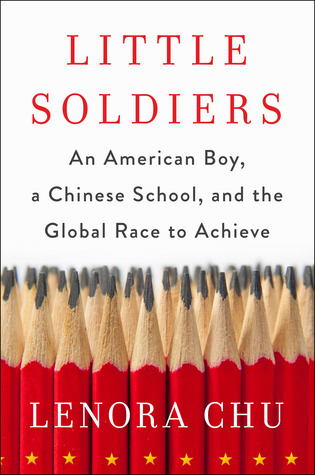 As the book goes on, Chu becomes increasingly positive about benefits of the Shanghai system, at least for her son in his high-performing urban school: over halfway through she writes: ‘the Chinese way is to hire good administrators and trust them to do their jobs; parents were to support the system, take responsibility for as much as possible, and keep petty distractions out of the equation. I didn’t disagree.’ In fact, Chu becomes increasingly concerned that her parenting methods conflict with the school and are potentially negating any advantages of the Chinese methods. All in all, this is a compelling read.